The Stratasan team was thrilled to once again attend and participate in the annual Society for Healthcare Strategy & Market Development (SHSMD) conference. The 2015 SHSMD conference was themed "Bridging Worlds for the Future of Healthcare" and focused on healthcare being more nimble and entrepreneurial but also based in storytelling. The general sessions were from entrepreneurs and storytellers and there were nine tracks for the concurrent sessions. Stratasan's session was in the Analytics and Research track. All sessions related to the SHSMD document, Bridging Worlds, the Future of the Healthcare Strategist, essentially bringing that document to life with storytellers and presenters. 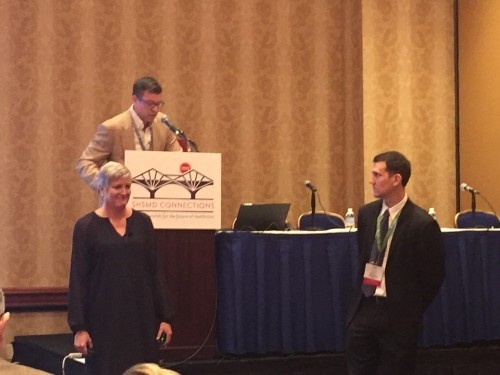 Stratasan's VP of Strategic Resources, Lee Ann Lambdin and Patrick Saale, Manager of Strategies Resources at LifePoint Hospitals (both pictured above) presented Python What? The Strategist as Data Geek. The two shared thoughts before a packed room on the role of the strategists to understand what data is needed, how insights can be produced, and how to use the data to help make better decisions. Lee Ann shared, "I learned that marketers are strategists, customers are king, big data is still confusing and overused, population health is going to change the health of our communities, product line marketing is still very important, and the Newseum is great for networking as well as learning about history." Listen to the audio from the presentation here.